A contingent of more than 500 Chadian troops entered Nigeria on Friday to “lend a hand” to the Nigerian army in its efforts to tackle the Boko Haram jihadist group, a Chad army spokesman told AFP. 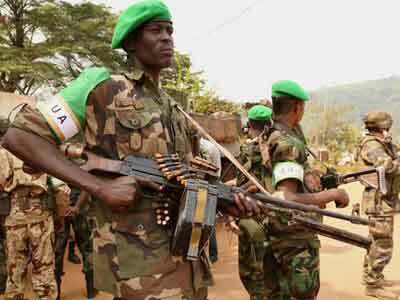 The soldiers, part of a regional force comprised of troops from Nigeria, Cameroon, Chad and Niger, will be deployed on Saturday, the day Nigerians will vote in presidential and parliamentary elections. Nigeria’s President Muhammadu Buhari, seeking re-election, vowed on Friday that voters will be able to vote, despite a week-long postponement and renewed violence. The election campaign has coincided with fresh violence in the north, blamed on both criminal gangs and Boko Haram jihadists. More than 200 people have died since the start of this month alone. In 2015 Buhari was elected on a promise to put an end to the Boko Haram threat. And the problem has spread across to the other countries in the Lake Chad region. On Friday four people were killed and seven more reported missing in an attack attributed to Boko Haram jihadists on a small settlement in southeast Niger, a local official there said. Five more killings attributed to Boko Haram were reported in Chad the previous day. Nigeria is the most populous African nation, with 190 million residents, and the continent’s biggest exporter of oil. Saturday’s elections are seen as of great importance to the stability of the region.